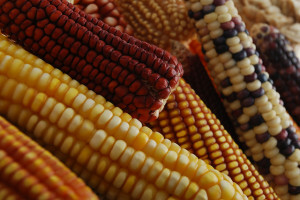 Maize is currently produced on nearly 100 million hectares in 125 developing countries and is among the three most widely grown crops in 75 of those countries (FAOSTAT, 2010). Between now and 2050, the demand for maize in the developing world will double and, by 2025, maize is expected to become the crop with the greatest production globally and in the developing world. Yet, maize yields in many developing countries are severely limited by an array of abiotic and biotic stresses, besides other factors. Production may not be able to meet the demands without strong technological and policy interventions. Uncontrolled area expansion cannot be a solution for this, as this could potentially threaten forests and hill slopes in the developing world. Long term production growth of 22 many crops, including maize, could be severely affected by water and fertilizer scarcity and global climate change. One of the expected threats of climate change is more frequent and severe drought. With most maize production dependent on rainfall, especially in the developing world, the crop is particularly vulnerable to drought and its yields fluctuate more widely from year to year than is the case for rice and wheat, which are more commonly irrigated. The impact of climate change on agricultural production will be greatest in the tropics and subtropics, with Africa being particularly vulnerable as a result of the range of projected impacts, multiple stresses and low adaptive capacity (IPCC, 2007). Predicted climate change scenarios for Africa include an increase in seasonal temperatures and extreme temperature events, sea level rise in low-lying coastal areas, and increased intensity of droughts (IPCC, 2007). Maize yield will decrease in nearly 75% of countries in Africa as a result of temperature increases and with rainfall difference becoming less conducive to maize production. This decrease in yield could be an equivalent of 10% of the total maize production in Africa and in Latin America (Jones and Thornton, 2003). Maize yields may drop by 17%, wheat by 12%, and rice by 10% in irrigated areas in South Asia because of climate change induced heat and water stress, if current trends persist by 2050 (IFPRI, 2009). Over 80% of maize grown in South and South East Asia is rainfed, with an average yield that is less than half of the irrigated maize. There is further increase in rainfed maize area at 1.8% per year, which is six times more than the irrigated area. The decline in the irrigated area is mostly due to the diminishing ground water table that puts the irrigated area under threat. This will be compounded by heat stress, with temperatures expected to increase by an average of 2°C across Asia, with an increase in annual precipitation and extreme weather events (IPPC, 2007; ADB and IFPRI, 2009). Stress tolerant and high yielding germplasm, sustainable crop and natural resource management, and effective policy interventions can help sustain food security in the face of population growth and climate change. The development of germplasm to offset expected yield losses under projected climate change scenarios, coupled with crop and soil management practices that reduce moisture stress will play an important role in adapting to climate change. How much will it cost to end hunger?